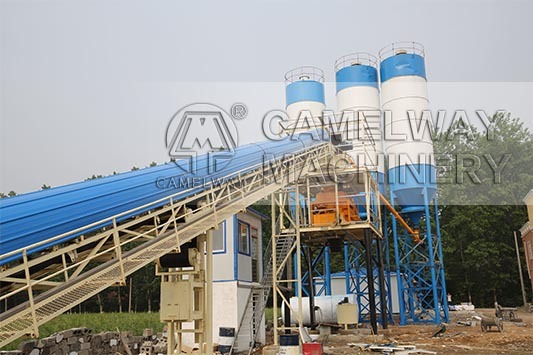 What is the advantage of stationary concrete batching plant? Most users often want to know. Zhengzhou CamelWay Machinery manufacture is one of the large-scale enterprise specializing in construction machinery for several years. Then, the company will give the answer. The machine has high output, high working efficiency, low energy consumption and long service life. It has unique design, compact structure, short mixing time, high mixing quality and high reliability. The machine has high degree of automation, which will largely save labor and improve the working efficiency of your concrete plants. It has high loading, discharging and measuring accuracy, which can ensure the high quality of concrete. At present, the company has many different stationary concrete batching plant for sale at low price. If you want to reduce the cost to import the concrete ready mixer from China, please feel free to contact us at any time.